Planning a wedding involve lot of things, as a result many people are involved creating and executing plans for smooth wedding ceremony. Now you can be your own wedding planner without too much stress using online resources at Google Docs. It has special section for tools and resources for Wedding planning and execution. 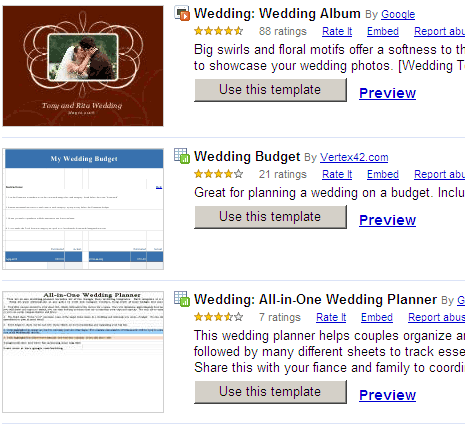 Checkout resources for wedding planning on Google docs and here is full list of free wedding templates. You can virtually execute each and every aspect of wedding ceremony. Here is video of two Google employes who successful used Google Docs wedding templates and resources for easy and organized wedding. Google Docs is more than just plain office documents and spreadsheet. It can really help you real life like planning a wedding and as previously seen resume & Cover Letter Google Docs to get started with job interview.